Thrive Leads VS OptinMonster: Which Is Best To Use? 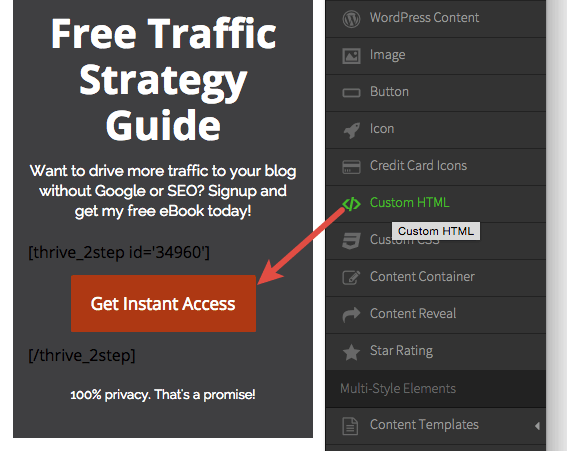 Thrive Leads VS OptinMonster: Which Is Best To Use For Your Website? When it comes to building your email list with WordPress, there are two stand-out list building tools currently available: Thrive Leads and OptinMonster. But the questions is, which one should you consider using? 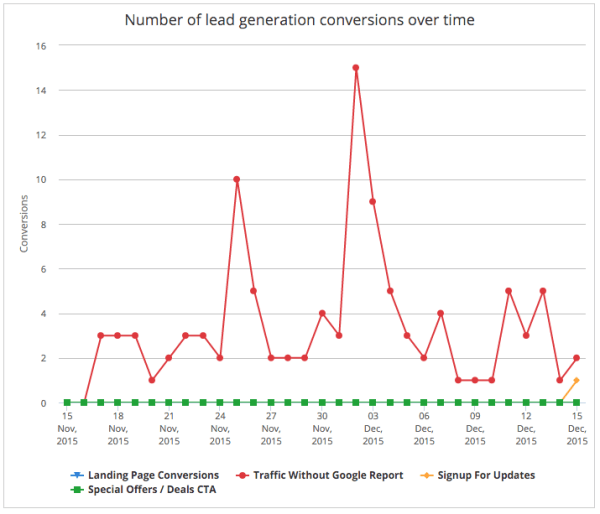 Lead generation is one marketing strategy that no online business owner can afford to ignore. With Google forever changing its algorithm rules, and with social media becoming the more pay-to-play platform, email list building has never been more crucial. That being said, building just any old email list won’t do you or your business any favors. You need to build a high-quality and engaging list, right? What would you prefer to have? A list of 10,000 zombies that never take action or engage with your content, or 1,000 highly targeted subscribers who are ready, willing and totally able to do business with you? I think I already know your answer to that question. 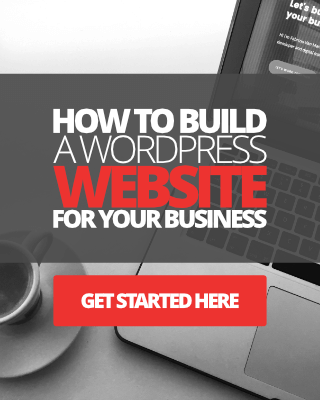 In any case, when it comes to generating leads through your WordPress website, or your blog, there’s an abundance of tools, apps, services available online today. Choosing the right tools for the job can be a bit of a challenge, I know this. So, in this post, we’re going to be looking at just two very powerful list building tools on the planet, they are, of course, Thrive Leads and OptinMonster. These two are amongst the most popular and most powerful opt-in form builder and list building plugins/tools available on the market. Hopefully, by the time you’ve finished reading this post, you’ll be in a better position to decide which of these two tools will be best suited for you and your business’s needs. Let’s first look at some of the key differences between these two list building and form builder tools. #1. 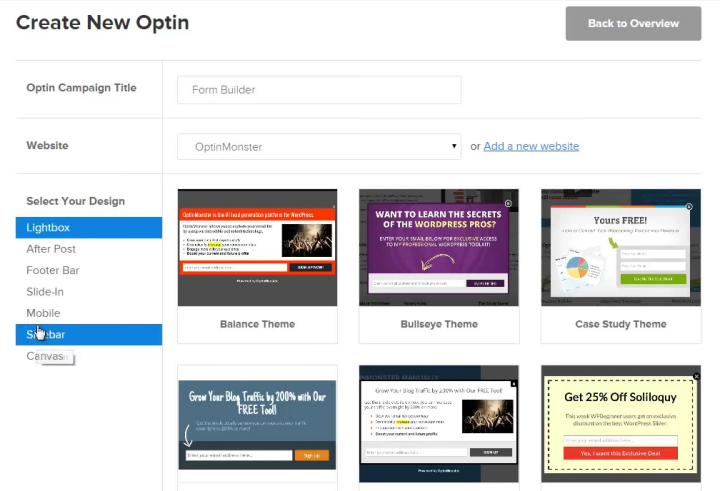 OptinMonster is the most popular list building and opt-in form builder available today! 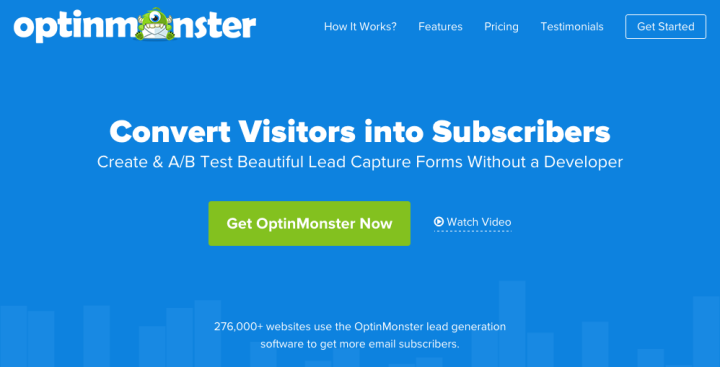 OptinMonster has been around for a little longer than most of it’s rival tools, which makes it one of the most favorable and popular opt-in form builder and lead generation tool currently being used. At the time of updating this post, OptinMonster is serving over 700,000 businesses and marketers around the world, including some of the industries top influencers, i.e. Chris Brogan, Neil Patel, and Joost De Valk, whether that makes any difference to you or not. Thrive Leads, on the other hand, bearing in mind that the tool is still relatively new on the market, already has over 50,000 users and growing very fast. #2. Just available for WordPress, or all other available platforms? One of the other significant key differences between these two tools is that OptinMonster is not just available for WordPress, but also available to use on many other popular website building platforms. 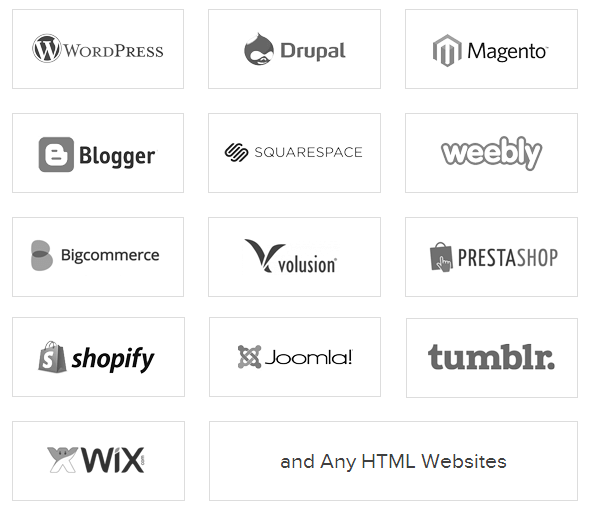 Essentially, this means OptinMonster will work on any website that is built on HTML. And much more… Click here for the full rundown. Thrive Leads, on the other hand, is only available for self-hosted WordPress users. OK, so let’s dive deeper and compare the built-in multi-tools and features of both Thrive Leads and OptinMonster. Now, having a built-in form builder that’s simple to use, even for complete newbies, is what really makes both these tools stand-out from the rest of the pack. Both Thrive Leads and OptinMonster offer a simple point, click, drag and drop form builder, complete with ready-made templates for you to use or customize and drop straight into your site. This essentially means you’re wasting a lot less time trying to code up forms manually yourself and spending more time generating leads. From my own experience with experimenting with both of these tools, I would go as far as to say that Thrive Leads form builder gives you just that little bit more flexibility than OptinMonster’s form builder! Again, that’s my own opinion purely based on how I’ve used both of these tools on my websites. With Thrive Leads, you get a ton of options and elements to choose from. You also have the ability to move, add, remove, resize, change literally everything you see in your forms, regardless whether you’re creating a form from scratch, or editing one of the built-in pre-designed form templates. The form builder in Thrive Leads uses the same beautiful UI technology found in the Thrive Architect plugin. 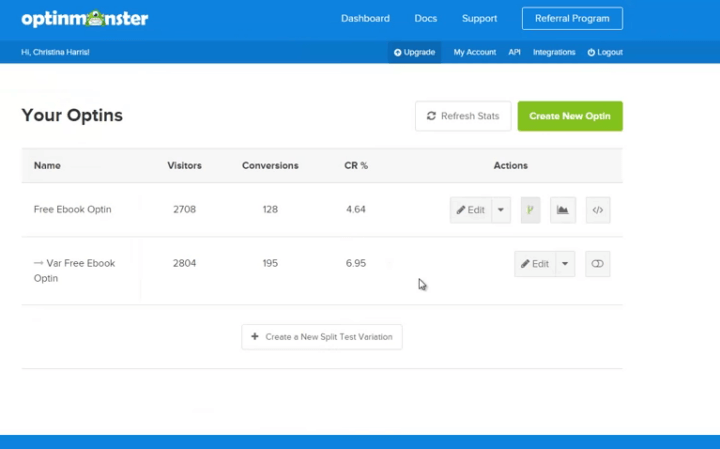 The quick video demo below shows Thrive Leads drag-and-drop form builder in action. I created this myself, however, the video is a few years old now, and many updates and new features have been added since I created it. I will update this video in the coming months. Optin-Monster also has a fantastic form builder with some great templates to choose from, however, I do feel like there isn’t as many options or elements to choose from for building your forms from scratch. That being said, the canvas is still very powerful for creating custom forms. It does require you to have some basic knowledge of HTML and CSS however. Both Thrive Leads and OptinMonster offers seamless API and HTML integration with all major email marketing service providers. These include Aweber, MailChimp, InfusionSoft and SendInBlue. Click this link to learn how to integrate MailChimp with Thrive Leads if you are using Thrive Leads. This is a massive plus point in my opinion, and more likely than not, both these tools will work regardless of who you use to serve your email marketing emails. When it comes to built-in tools and features, both these plugins pull huge punches. Let’s take a look at them below. List building/Opt-in form builder plugin for WordPress hosted websites. Drag ‘n’ drop form builder. Alternative content for subscribers only. List building/Opt-in form builder plugin for WordPress & HTML websites. So, as you can see from the list above, there’s very little difference between both these tools as far as features go, which makes it very tough to decide which tool to use for your business. So far, we’re in the middle of the road for both these tools, however, I should mention this now, not all the features outlined above are available with all the OptinMonster plans. I’ll talk more about that later on. Thrive Themes are always adding new features to their list building plugin, which makes Thrive Leads one of the most exciting opt-in form building tools to use. I’m a complete sucker when it comes to conversions and analytical tools. I love spending time studying visual charts and graphs and all kinds of user data. And so no list building plugin would be complete without these essential features. 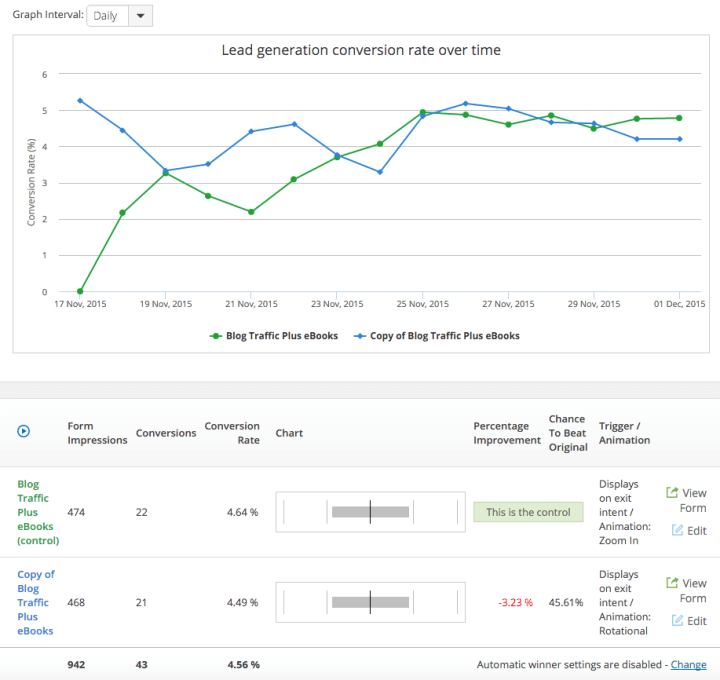 Both Thrive Leads and OptinMonster offer some very powerful and useful conversion optimization analysis, and metric tools of their own. 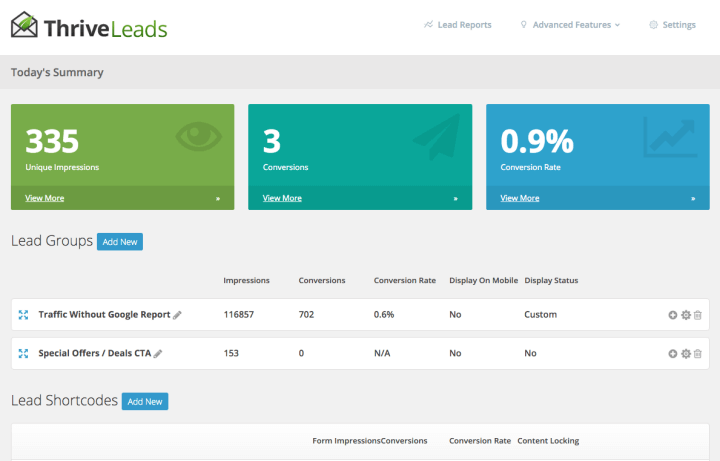 Thrive Leads have a full suite of built-in A-B testing reports, conversion reports, lead referral reports, lead tracking reports, content marketing reports and more. 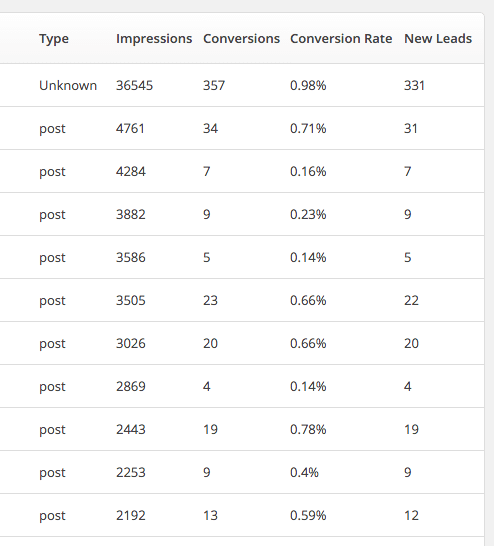 OptinMonster also offers conversion reports and content marketing reports. OptinMonster has an annual billing structure, whereas with Thrive Leads you only pay a one-time fee to use their product. With Thrive Leads, you can pay $67 for single site use. $97 for unlimited multi-site use. $49 per month for full access to not only Thrive Leads, but all the plugins and tools available in the Thrive Themes Membership package, including Thrive Landing Pages, themes, and Thrive Architect. It’s worth noting that regardless of the plan you choose with Thrive Themes, you get full access to all of the features inside of Thrive Leads. Check out my full review of Thrive Themes Membership here. With Optin-Monster, on the other hand, you can pay $49 per year for single site use, and with limited access to features. $99 per year to use on up to 3 sites, with access to everything from the basic plan, plus some additional features. 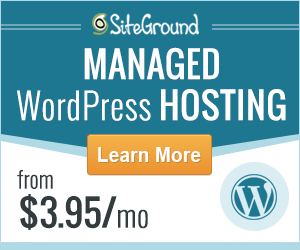 $199 per year to use on unlimited sites, with access to all features. OK, so far, so good, right? Now let’s take a quick look at a list of the pros and cons for both of these tools. Easy to integrate into WordPress website using a dedicated plugin for API authentication. Available for all website platforms built on HTML, not just WordPress. 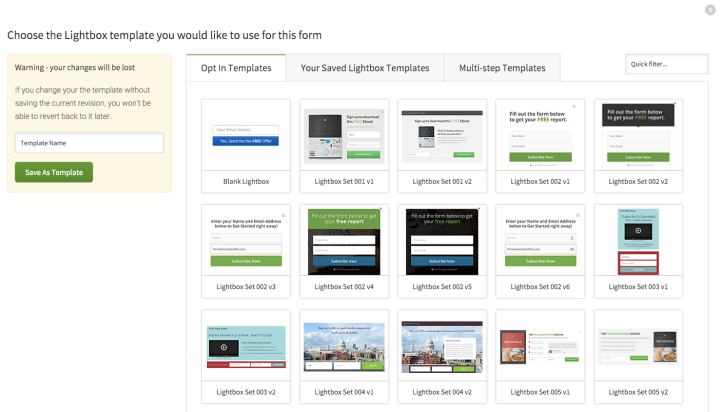 Easy-to-use intuitive drag-and-drop opt-in form builder with templates. 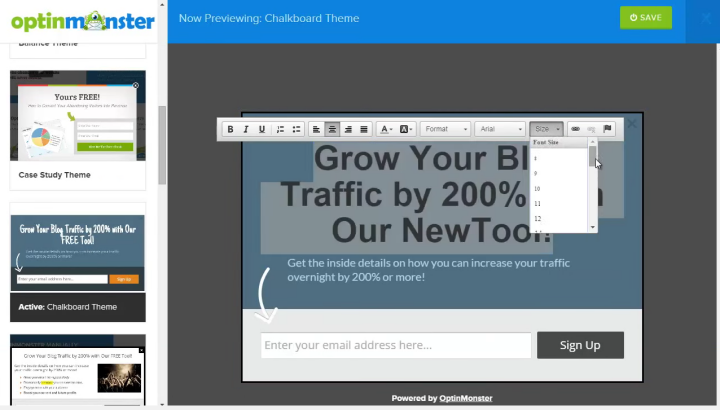 Huge list of features and built-in conversion optimization tools. Documentation, reference materials, and tutorials. Not the most affordable solution. Basic plan at $49 only gives you access to limited features. Limited elements available in form builder. Ready-made forms, not 100% editable. Canvas form builder requires some knowledge of coding, HTML and CSS. Affordable one-time payment gives you full access to plugin features across all plans. Thrive Membership / Developer Plan available for web designers. Easy to integrate into WordPress website using a dedicated plugin. Easy-to-use intuitive drag-and-drop opt-in form builder with a full suite of basic and advanced elements. Fully editable and customizable ready-made templates. 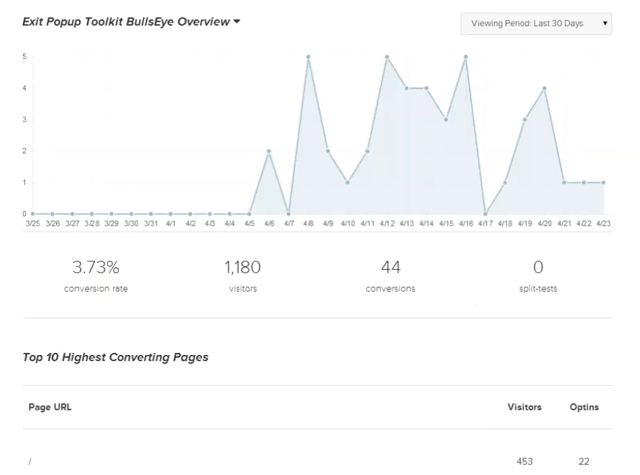 Full conversion analysis, reports, and metrics. Member’s support forum and tutorials. 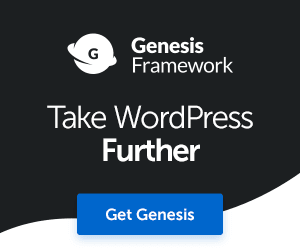 Only available for WordPress self-hosted sites. User interface although attractive can be a little overwhelming for new users. I love both of these tools. They both boast a ton of awesome features, useful benefits, and complete ease-of-use. It’s easy to see why they’re both industry leaders. However, if I had to pick one to use in my business it would be Thrive Leads. Firstly, the price structure I think is hugely appealing if you’re thinking of buying Thrive Leads. If you have more than one site that you want to build an email list on, then Thrive Leads at just $67 one-time payment for unlimited sites, is pretty hard to beat. Secondly, it’s so simple to install, configure and start using. And not to mention it’s extremely powerful. It’s the complete works. Again, Thrive Leads hasn’t been around as long as OptinMonster, yet it’s already proving to be a force to be reckoned with. The built-in conversion tools, reporting, and A-B split testing tools are a clear winner for me. In addition, Thrive Leads is constantly evolving into a better tool/plugin. So, Shane and Co have done wonders with this plugin, things can only get better, right? And please don’t get me wrong here folks, this isn’t to say that OptinMonster isn’t a great tool, because it absolutely is. I mean, 700,000 users can’t be wrong. I’ll now leave you to decide which tool would be best suited for your conversion goals. Enjoy. Check out this post to learn how I’m using Thrive Leads to grow my email list. 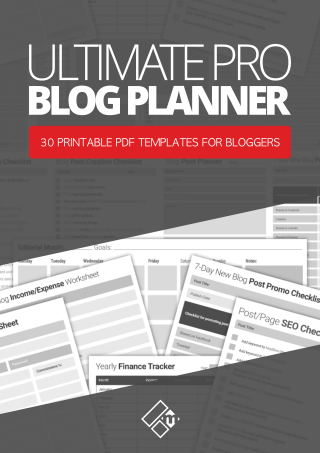 Why You Should Start Planning Your Blog Or Online Business For Next Year, Now! Honestly I should’ve looked into Thrive Leads a bit further when I chose to upgrade my pop-up plugin (I was using Pippity previously) but I just went immediately into OptinMonster because at the time I believed it to be the best in the price range. Usually I’m better at doing my due dilligence and when my 1 year is over maybe I’ll end up making the switch. You’ve definitely given some compelling reasons to choose Thrive Leads over OptinMonster, especially for the price. For now though there’s really nothing that makes me want to immediately switch – OptinMonster is actually doing better than what I expected. But hey, always looking to improve! Hi James, Thrive Leads is a great tool, with a lot of powerful features built. I would recommend it to anyone. The conversion metrics and tools, as well as the ability to have full control over opt-in form design is among the big stand out features. It’s still a relatively new tool on the market and already with so many new features being added, Thrive are making a lot of noise with this one. My son uses Thrive Leads and attests to the value for money, ease of use and general functionality of this product. The other one looks good too, but as you say is a bit pricey. Thanks for providing a well balanced, professionally presented review. This will help a lot of people. Hey Kim,your son made the right choice 🙂 OptinMonster is the most popular by far of course, plenty of people swear by it. I love it too and it’s easy to use, though I’ve now stopped using it and replaced on my websites with Thrive Leads, only because of the extensive features and marketing tools built in. Plus I love having full control over my opt-in form designs. Thank you for writing such an informative post, Fabrizio. I prefer to use Optin Monster, it’s quite expensive but has a lot of features and definitely worth every penny.